Mobile devices have fundamentally altered where and how we use technology. The concept of the traditional office and 40-hour work week have faded away because people can stay connected and get things done virtually anywhere and any time. Smartphones are convenient for checking email and performing basic tasks, but too small for any real productivity. Tablets, on the other hand, are large enough to work on and have a variety of unique advantages over laptop PCs, but still face challenges when it comes to running the software users need, or keeping data synced between the tablet and a PC. The tablet is an ideal mobile computing device. Tablets are exceptionally light and thin compared to traditional laptop PCs, and most are svelte even by Ultrabook or netbook standards. A few ounces can make a huge difference when you’re lugging a device around all day. Tablets are more convenient to use on the go than a laptop PC. Laptops are cumbersome—they need a surface to sit on and have to be opened up to be used. A tablet is flat, and it can be held in one hand. A touchscreen display makes it easy to navigate the device and open apps even while walking down the hall. Exceptional battery life is another hallmark of tablets. Most laptops can only survive a few hours at best, and even Ultrabooks top out around 7 hours on average. But, most tablets can make it through an entire workday on a single charge, freeing you up from power cords. Despite the advantages, tablets face a number of obstacles when it comes to business productivity. Most tablets use a mobile operating system like iOS or Android. They can only run apps that are specifically developed for the mobile OS, which means they can’t run the software businesses rely on, like custom applications or productivity suites like Microsoft Office. The ports and slots available on a tablet vary widely from one device to the next, but from a hardware perspective most tablets are very limited. A USB port or SD memory card slot are useful for expanding the limited storage capacity of the tablet, or simplifying the process of moving data to and from the device. Tablets running a mobile OS also can’t join a Windows network domain. That means they can’t be managed with Active Directory and Group Policy like desktop and laptop PCs, and they can’t be monitored or protected using the same tools the business is already using. They either require additional applications and effort, or they’re just ignored and act as rogue devices that expose the company to risk. Tablets running Windows 8 Pro straddle the line between PC and tablet, and let users enjoy the benefits of a tablet without sacrificing productivity or security. 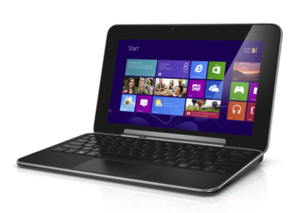 The beauty of a Windows 8 tablet like the Dell Latitude 10 is that it is simultaneously a Windows PC and a tablet. The new tiled interface of Windows 8 provides a slick experience equivalent to iOS and Android mobile devices. There are tens of thousands of apps available in the Windows Store—games, entertainment, productivity, social networking, and other apps designed specifically for a mobile, touchscreen experience. A Windows 8 tablet also has something that other tablets are missing, though—a desktop mode that runs legacy Windows software. That means you can still use Microsoft Office or your custom CRM tool on your tablet. All of your software and data is right there with you no matter where you are. With an optional docking station, you can just snap the tablet into place while working at your desk, and it is functionally identical to a traditional desktop or laptop PC. The docking station keeps that tablet charged, and instantly connects the device to an external monitor via HDMI, to a wired gigabit Ethernet network connection, and to other devices like a full-size keyboard, mouse, and printer via USB. While using the device in this configuration, you can forget that it’s a tablet at all. When it’s time to go to a meeting down the hall, or visit a client, or go home for the day, though, you can just take the tablet out of the docking station and be on your way. Unlike having a separate tablet running a mobile OS, you don’t have to jump through hoops to find compatible apps or ensure your data is synced because everything is still there on your PC. It’s just much more convenient to take with you or work on the go than it would be with a desktop or laptop PC. A Windows 8 tablet can be joined to a Windows network domain and managed using Active Directory and Group Policy. It lets you monitor and enforce security policies, and manage access using the same software and tools you use for the rest of your desktop and laptop PCs. Don’t waste money buying both a laptop and a tablet, and don’t waste time debating which is better for mobile productivity. A Dell Latitude 10 is both a tablet and a full Windows 8 PC. It gives you the best of both worlds and lets you jump on the tablet revolution without sacrificing productivity. This story, "Work Hard and Stay Portable with Windows 8 Tablets" was originally published by BrandPost.